This past Friday, Oct. 25, Adafruit Industries hosted the final session of their Make The World: Prosthetics Program series of Google+ hangouts on crowdsourcing prosthetics. Matt Stultz of 3D Printing Providence put together a Make The World: Prosthetics Build Party at AS220 Labs to assemble as many local printers as possible to 3D print prosthetic hands for those in need. 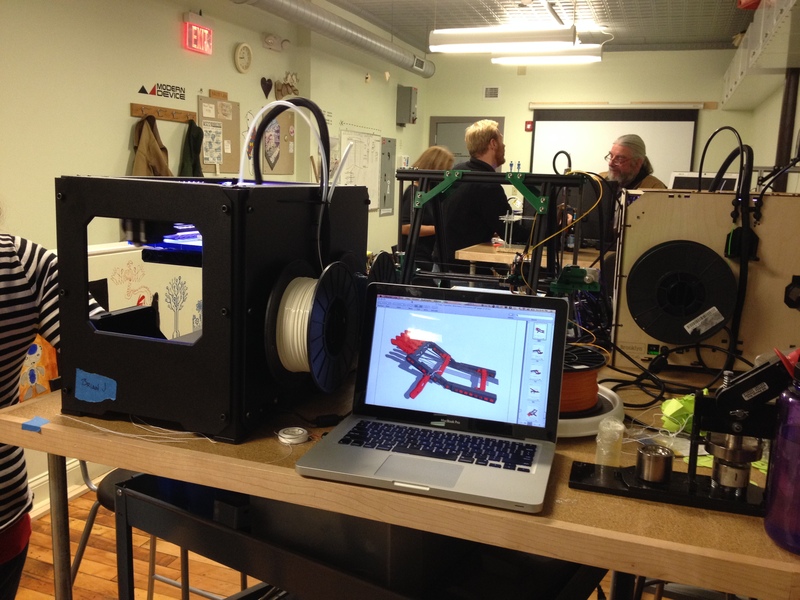 There was a tremendous response from the local maker community and all available tables were filled with printers. Many of the printers in attendance were built by 3DPP members during their “CastMax” (Mendel Max build using cast, not printed parts) build workshop. Nineteen 3D printers were transported by individual makers to the lab where they printed Michael Curry’s freshly updated version of the MakerBot Snap-Together Robohand, based on the Robohand project. Matt Stultz demonstrates the Robohand. We were lucky enough to have 19 printers at the event, here is a sampling of a few of them replicating prosthetic Robohands, destined for Africa. Have you been involved in the Make The World: Prosthetics Program? We want to hear from you!